BELIZE CITY, Apr 9 2015 (IPS) - A five-year project launched here in Belize City in March seeks to cement a shift in view of climate change and its impact on Belize’s national development. The Belize Marine Conservation and Climate Adaptation Project (MCCAP) has dual goals: putting in place structures to ensure continued protection for marine protected areas, and ensuring that those who benefit from use and enjoyment of those areas are educated on the dangers of climate change and given means of sustaining their lifestyles without further damage to precious natural resources. Approximately 203,000 Belizeans live in coastal communities – both urban centres such as Belize City and the towns of Corozal and Dangriga, as well as destinations for fishing and tourism such as the villages of Sarteneja, Hopkins, Sittee River, Seine Bight and Placencia. 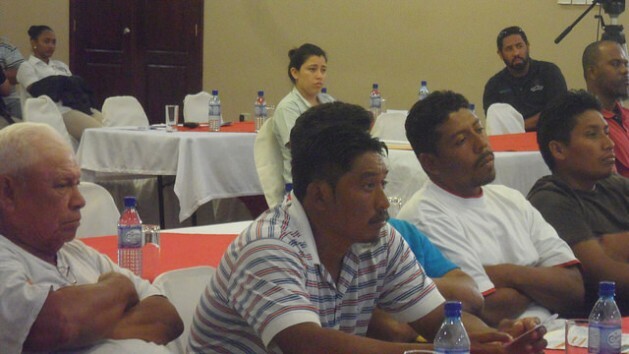 For these persons, and for Belize, “Climate change is not an environmental issue. Climate change is a development issue,” said World Bank representative and senior environmental specialist Enos Esikuri, who noted that keeping the focus on the environment on this issue would result in “losing the audience” – those who make their living directly from the sea through fishing and tourism. According to Esikuri, there has been a change in Belize’s economy from a purely agriculture base to a service-based economy with tourism as a primary focus – but the marine resources in Belize’s seas and rivers are integral to the success of that model. Belize also has to pay attention to the intensification of weather systems and how the reef protects Belize’s fragile coast and communities, he said. Of Belize’s three billion-dollar gross domestic product (GDP), fishing accounts for 15 percent; 4,500 licensed fishermen and about 18,000 Belizeans are directly dependent on fisheries for their livelihoods. However, tourism accounts for almost 25 percent of GDP and a significantly greater population living in coastal communities earn their livelihoods from this industry, Esikuri explained. The Barrier Reef and its fish are a very important resource for this industry, he said, so protecting it safeguards more livelihoods. The local Ministry of Fisheries, Forestry and Sustainable Development has received 5.53 million dollars from the World Bank’s Adaptation Fund, with the government contributing a further 1.78 million dollars for the programme, which seeks to implement priority ecosystem-based marine conservation and climate adaptation measures to strengthen the climate resilience of the Belize Barrier Reef system. The MCCAP project will invest 560,000 U.S. dollars to raise awareness about the impacts of climate change, and educate people about the value of marine conservation, and how climate change will affect their lives. The project will explore and develop strategies to help coastal communities become more resilient to climate change, and will encourage community exchange visits to help the people learn how they can adapt to climate change. Project Coordinator Sandra Grant says that of the three components to the project – upgrades to existing protected areas in Corozal, at Turneffe Atoll and in South Water Caye off Placencia, developing community-based business ventures in aquaculture, agriculture and tourism and raising awareness on the impact of climate change and developing and exploring climate resilient strategies – it is the second one that she expects will have the most impact. “We are going to look at the marine protected areas, but at the same time we are going to start the livelihood activities, because sometimes if you don’t show people the alternatives, then they will not buy in to what you are trying to do. So although it is three different components we decided to put them together simultaneously,” Grant said. The selected protected areas were identified as priority by the project because of their contribution to the environment. She added that fishermen and other stakeholders will be able to take advantage of new strategies for economic benefit such as seaweed planting, sea cucumber harvesting and diversification of business into value-added products. Part of the project will help finance community-based projects to create small-scale seaweed farms to take advantage of the global demand for seaweed for use in cosmetics, pharmaceuticals and even in ice cream. A cooperative in Placencia has already pioneered growing and drying seaweed for export. The bottom-feeding sea cucumber could become a cash cow as a prized delicacy and medicinal property in Asia and China. Belize already exports about 400,000 pounds per year and prices range from 4-8 Belizean dollars per pound though the dried product fetches as much as 150 U.S. dollars per pound internationally. Again, one cooperative already has investments in this area. Corozal Bay Wildlife Sanctuary, Turneffe Atoll Marine Reserve and South Water Caye Marine Reserve will install various features to assist in protection of their native marine and coastal ecosystems, including coral nurseries for the latter two. Each of the components has its own budget and will be pursued simultaneously with each other.